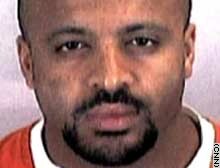 Zacarias Moussaoui denies involvement in the September 11 attacks. Should prosecutors allow 9/11 defendant Zacarias Moussaoui access to a jailed al Qaeda leader? Attorneys for Zacarias Moussaoui argue that the U.S. government should drop its case unless the defense has access to Ramzi Binalshibh. ALEXANDRIA, Virginia (CNN) -- The Justice Department refused a federal judge's order to allow terrorism suspect Zacarias Moussaoui access to a captured al Qaeda leader Monday, citing national security concerns. The government said it recognized U.S. District Judge Leonie Brinkema could throw out the case against Moussaoui, the only person charged in connection with the attacks of September 11, 2001. Her decision is expected Tuesday. If Brinkema dismisses the charges, prosecutors said they would automatically appeal to the 4th U.S. Circuit Court of Appeals in Richmond, which has been monitoring the matter. Brinkema could instead choose to dismiss some charges, restrict government evidence or block the government's pursuit of the death penalty. If Brinkema orders anything short of dismissal, the government said it wanted a full schedule of hearings on how best to proceed. It also insisted she stay any action pending appeal. The 10-month legal standoff stems from Moussaoui's claim that Ramzi Binalshibh can clear him as an alleged participant in the September 11 conspiracy. Binalshibh, a 31-year-old Yemeni, is accused of being a member of an al Qaeda cell in Hamburg, Germany, that consisted of three of the four September 11 pilots, including ringleader Mohamed Atta. He has been held by the U.S. military as an enemy combatant overseas since he was captured 10 months ago in Pakistan. Moussaoui, 35, an admitted al Qaeda member who allegedly underwent military training in Afghanistan in 1998, is charged with terrorism conspiracy and accused of collaborating with the 19 hijackers. He contends he was tapped for a different plot against American interests outside the United States and that Binalshibh would exonerate him of any role in the attacks. Brinkema sided with attorneys assisting Moussaoui, who is representing himself, in ordering the government to allow him to question Binalshibh via satellite hookup. Her original ruling was made January 31. The attorneys argued that Moussaoui's right to a fair trial, as guaranteed by the Sixth Amendment, depends on his constitutional right to call available witnesses of his choosing. The Justice Department appealed the January order, but a three-judge panel of the 4th U.S. Circuit Court of Appeals said it could not step in until Brinkema ruled on the government's response to her order. Two weeks ago the court turned down a request for a rehearing. The indictment alleges that Binalshibh wired Moussaoui $14,000 in August 2001 to help him pay for flight school. The government's theory has been that Moussaoui's actions mirrored those of the hijackers, but the government has wavered on whether it believes Moussaoui was meant to be the 20th hijacker or part of a fifth hijacking team that day. Moussaoui, a French citizen of Moroccan descent, was jailed on an immigration violation a month before September 11 after he aroused suspicions at a Minnesota flight school; he sought Boeing 747 simulator training though he had no pilot's license and could not even fly a Cessna. Prosecutors say allowing testimony from Binalshibh would damage national security, particularly because it would disclose classified information to Moussaoui and the public. "The deposition, which would involve an admitted and unrepentant terrorist (the defendant) questioning one of his al Qaeda confederates, would necessarily result in the unauthorized disclosure of classified information," the Justice Department said in Monday's three-page pleading. "The enemy combatant [Binalshibh] is a source for intelligence, and the executive branch, in a decision entitled to deference ... has determined that everything he says ... is properly classified," prosecutors said in an earlier motion. Justice Department officials expressed confidence that the 4th Circuit Court of Appeals was ready to rule on the merits of the dispute with Brinkema. "The Fourth Circuit has already indicated it is prepared at this time to rule on the substantive questions before it," the government said in Monday's pleading. The government's response came less than an hour after the full 4th Circuit Court refused 7-5 to reconsider the earlier decision by the three-judge panel for the same reasons. Prosecutors argued before the appeals court last month that Brinkema's order, by disclosing classified information and interrupting the interrogation of an enemy combatant who is not a U.S. citizen, would jeopardize national security and subvert President Bush's constitutional power as commander in chief during the war on terrorism. Besides Binalshibh, Moussaoui has petitioned the trial court for access to al Qaeda operations chief Khalid Shaikh Mohammed, alleged money man Mohamed al-Hawsawi, and training camp gatekeepers Abu Zubaydah and Ibn Shaikh al-Libi -- all of whom are being held at undisclosed military locations. The Bush administration, which has shifted two post-September 11 criminal prosecutions to the military justice system, has weighed labeling Moussaoui an enemy combatant and doing the same with him. CNN's Terry Frieden and Phil Hirschkorn contributed to this story.